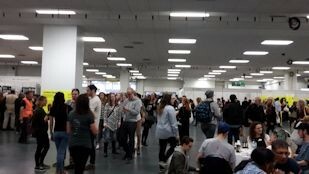 One of our best discoveries at this year’s VegfestUK show www.vegfest.co.uk at London Olympia was the delicious dairy free chocolates from Almighty Foods www.almightyfoods.co.uk a first time Scottish exhibitor. The Cashew Butter botanical raw chocolate - creamy cashew, coconut and vanilla chocolate – literally melts in your mouth. Other varieties include Golden Blonde and Coconut and Orange. The company also produces an array of nut butters such as Cashew Caramello and Raspberry Whip Gourmet, a fruity nut butter. You can order the products online, although there are stockists in Scotland. It can only be a matter of time before these delicious products are stocked country-wide. When is an ice cream not an ice cream? 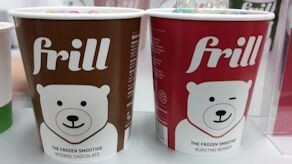 When it’s a Frill frozen smoothie www.frill.eu that doesn’t contain cream or eggs – instead it’s a mix of maize, water, dates and dietary fibres. The result? An array of tantalising dairy free desserts in flavours such as chocolate and strawberry, which taste like ice cream but are dairy free and contain around half the sugar. The packaging features an appealing bear. Various stockists including Waitrose and Whole Foods – see web site for more. 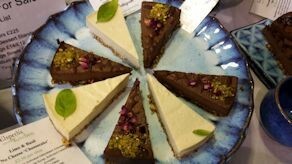 We were impressed by the array of vegan tortes on display at Elspeth’s Kitchen www.elspethskitchen.com These are gluten free, dairy free, soya free and refined sugar free. They look like works of art. In particular, we loved the chocolate and orange torte – delicious! People crowded round the Bute Island Food stands www.buteisland.com to sample its dairy free vegan cheeses under the ‘Sheese’ brand. The mozzarella, mature cheddar, cheddar and chive and Greek style dairy free cheeses were all very tasty. Samples disappeared almost the moment they were put out and the staff were hard pressed to keep up. My favourite was the mature cheddar. It’s always difficult to find dairy free cheese which taste this good – normally it has a very synthetic taste. See the web site for stockists. The Vegan Sweet Tooth www.giancarolroncato.co.uk stand displayed its extensive range of vegan cakes, all beautifully decorated, such as Raspberry and Vanilla Marble Cake, Carrots and Dates Cake and Camomile and Zucchini cake, some of which are gluten free. 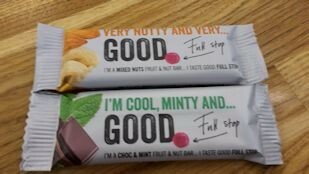 Good Full Stop www.goodfullstop.com showcased its new range of bars, made from dates. Our favourites are Mixed Nuts Fruit & Nut Bar (made from dates, cashews and hazelnuts) and Chocolate & Mint Fruit & Nut Bar. 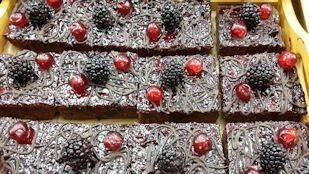 They are gluten and dairy free, available to buy online. 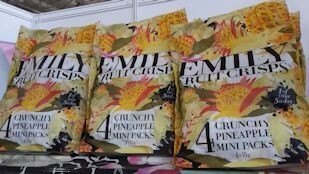 Another newcomer was Emily Fruit Crisps www.emilyfruitcrisps.co.uk Named after one of the co-founders, these fruity crisps are delicious. We tried several varieties such as Crunchy French Bean Sugar Snaps and Black Edamame, Crunchy Banana (my favourite) and Crunchy Sweet Potato Carrot & Beetroot. Available to buy online as well as stockists such as Ocado and Holland & Barrett.